Natural cycle chart courtesy of Iogen. The ability to make ethanol from straw-- rice straw, wheat straw, oat straw, etc—is the modern day equivalent of the Holy Grail or the Philosopher’s Stone. In a time when barely any new oil fields have been discovered in the past ten year-- and a war in Iraq rages with such anarchistic abandon that it seems unlikely that anyone will be able to pump oil for a the next several year—well, the news that we can run our cars on this “new” fuel is a breathe of fresh air. Literally! Ethanol burns much cleaner that gasoline, and doesn’t add fossilized CO2 to the atmosphere: it is recycling present day CO2. to convert glucose AND xylose into ethanol. But don’t expect that we small scale distillers will be able to buy this anytime soon. It's the property of Purdue University & they have taken a completely novel approach to marketing this patented technology. They are “leasing” (not selling) the yeast to a Canadian company, Iogen. http://www.Iogen.ca Iogen is already producing ethanol and selling it to Petro-Canada for mixing with gas. They are claiming 75 Gallons per ton of straw, with roughly 2/3 of the straw being converted. It is interesting that Iogen and Shell chose to announce this product to the world in Europe, which historically has been actively fighting any GMO products. Just a week later in Madison, Wisconsin, the 20th annual Fuel Ethanol Workshop had over 1500 ethanol industry attendees, including Iogen-- an exhibiting company, but no mention of this breakthrough was mentioned. Apparently, Iogen, Shell, and Petro-Canada are playing their cards close to their vests. The market for fuel ethanol is established beyond any doubt: it is presently a 3 billion dollar/year industry. By keeping this technology to themselves, a new bio-technology industry promises to be the new Middle East in terms of fuel supply. The other corporate players in this announcement, DaimlerChrysler and VW, have long produced cars that will run or 85% to 100% alcohol--previously only in Brazil, but now in the US, too. This above link lists various accidents and very dangerous and toxic side effects of genetic engineering efforts so far. An unrelated but somewhat parallel effort to produce a GMO yeast produced very high toxic levels of a mutagenic product, methyl glyoxal, with the potentially undesirable effect of getting loose into the food chain. Big business stands to make billions on GMO products, especially one such as a new organism that can readily turn straw into fuel. The Iogen press release, below notes that collaborated with Shell and Petro-Canada. It seems the real credit goes to Dr. Nancy Ho, a Purdue scientist who made her breakthrough in 1993. No mention was made of her or Purdue University in any of the Iogen or Shell press releases. In terms of agriculture, if GMO organisms can be contained within the capital intensive manufacturing facilities (where trucks hauling rice and wheat straw will come and go every day) this means that farmers will no longer burn their rice straw. This will have an additional effect of containing CO2—nobody likes the smoke from huge field burns. But on the other hand, if these trucks end up picking up some “hitch-hiker” organisms on their rounds, the possibility of a GMO yeast that dissolves xylose, if it gets out into the environment, sounds like a script from a science fiction thriller. Shell advert, June 2004 United In-Flight magazine. 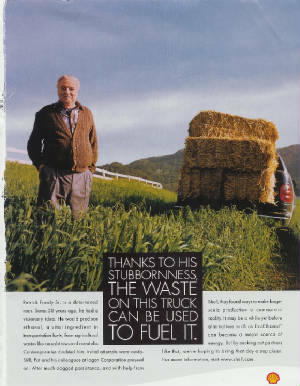 Photo of Patrick Foody, Sr., Iogen Corp.
Read the story of Butanol (another type of alcohol that makes a good fuel). We almost had a huge rice straw to alcohol plant in Fresno in 1971. Ottawa – Iogen Corporation announced today that it is producing the world’s first cellulose ethanol fuel for commercial use. 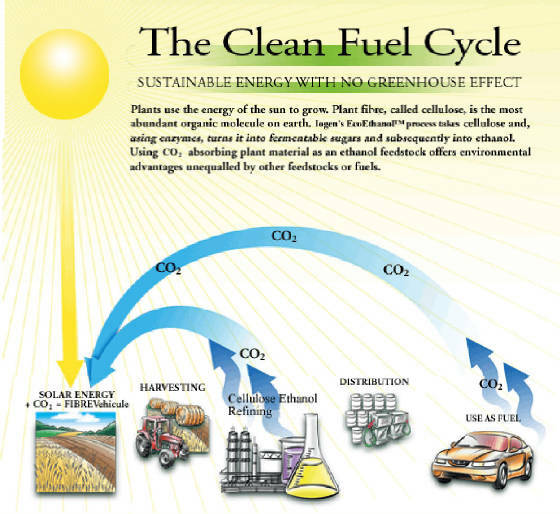 Cellulose ethanol is an ultra-low CO2 emission fuel that can be blended with gasoline and used in cars today. Iogen’s cellulose ethanol technology is a result of more than 25 years of research and development. Iogen and its partners have committed over C$110 million, and the company owns and operates the world’s only cellulose ethanol demonstration scale facility. “All vehicles can use a standard blend of up to 10 per cent cellulose ethanol mixed with gasoline, with no changes required. “Iogen’s cellulose ethanol demonstration facility is the final proving stage prior to the rollout of full-scale commercial plants. The company is working with its partners to finalize plant locations. See related article on Iogen, Shell, & Daimler Chrysler. Click here. According to Business Week, Dr. Nancy Ho and Purdue aren't the only players in that lucrative bioethanol arena. "The race to create new microbes capable of fermenting the full range of sugars found in biomass has followed several successful pathways. Dr. Lonnie Ingram at the University of Florida started with an E. coli bacterium capable of metabolizing multiple sugars and added the ability to make ethanol-a feat for which he received U.S. Patent #5,000,000 in 1990. His work was sponsored by the Biofuels Program and others. Taking an approach that complements Dr. Ingram's E. coli, other DOE researchers started with the bacterium Zymomonas, a naturally efficient ethanol-producing bacterium, and added the capability for utilizing multiple sugars. (see "Zymomonas recognized by scientific peers,"). DOE also helped support Purdue's Dr. Nancy Ho, who started with the "industrial workhorse" for ethanol production-the yeast Saccharomyces-and added the capability for utilizing multiple sugars. All three organisms are now being tested by industrial partners for use in bioethanol production." Here is the Department of Energy (DOE) link that describes current breakthroughs in converting agricultural waste straw into ethanol for fuel. 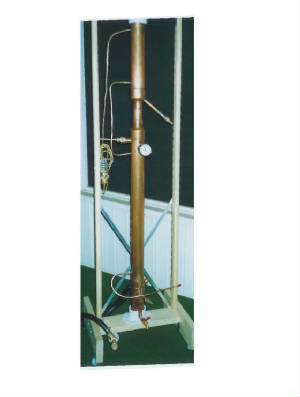 Click on this link to learn how to build your own alcohol still.